While the concept of “going on a diet” when the New Year rolls around seems a bit cliche, Aprilanne Hurley’s Party Girl Diet ™ is extraordinary when it come to revealing diet and lifestyle secrets proven to help you lose weight without the deprivation and restrictions of most “diets” out there. Now while the name is fun, the Party Girl Diet ™ is not a fad or “crash diet. It is a healthy sustainable lifestyle based on trusted research and nutrition facts – combined with diet and lifestyle choices of the healthiest and longest living people from around the world. So what have you got to lose? 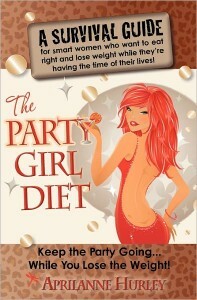 Get your copy of the Party Girl Diet ™ today and score your FREE Party Girl Diet ™ Kindle/E-book edition! Simply Go to the Party Girl Diet ™ Book Page on Amazon.com and you will see the following promotion to let you know The Party Girl Diet ™ is participating in Amazon’s new kindle matchbook program – proceed to buy a “new” Party Girl Diet ™ paperback book and get the Kindle edition FREE.